"Let’s be clear, when I say the MacBook has an annoying problem I’m not talking about the paltry number of Thunderbolt ports, the lack of an SD card slot, or the fact that they’re priced way too high for such pitiful processors. The most annoying problem with the MacBook and the MacBook Pro is that the keyboard on each can be brought to their knees by a god dang crumb. But now, a patent found by The Sun suggests a fix could be on the way for future versions of Apple’s laptops. Currently, if you have a penchant for croissants, toast, or Frosted Mini-Wheats, a single speck of detritus from your meal can spell the end of a typing session. 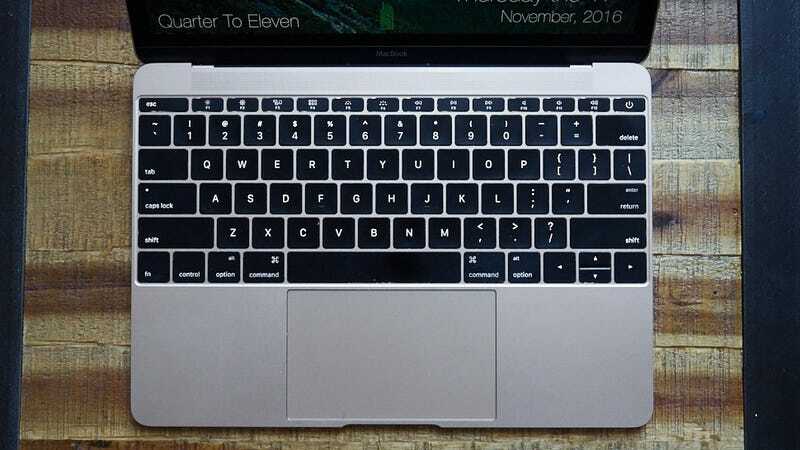 The problem is that the keyboards on the MacBook and MacBook Pro are super shallow. When you press a key it only moves (or “travels”) less than a millimeter. A normal keyboard on a laptop has a travel distance of 1.5 to 2mm while the travel on a fancy mechanical keyboard is often 3mm or more. Travel is one of the many ways you judge whether a keyboard feels nice to type on, and Apple’s shallow travel has earned ire since it was introduced with the MacBook in 2015...."